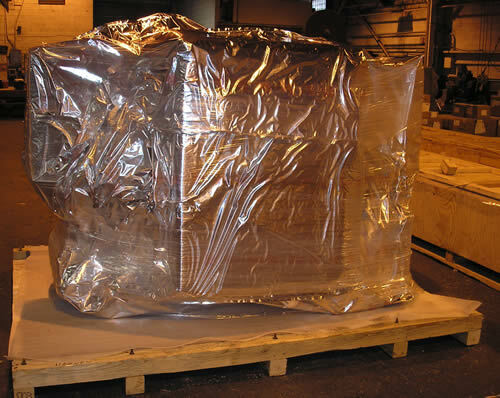 OUR WOODSHOP manufactures a variety of unique packaging and other handling materials including skids, boxes and dunnage. These materials are frequently combined with our moisture barriers, films and specially impregnated or processed wrapping to assure atmospheric protection. You get the best protection at the lowest possible cost. PRESERVATIVE APPLICATION is another important service we provide. We have in-plant facilities for dip tank coating and for other proven methods of preservative application. Compare our costs for these services against your present methods. SPECIALIZED EQUIPMENT gives you assembly line efficiency and reduces handling time. Woodfab's facility includes overhead cranes with 10 ton capacities; lift trucks with 6000 to 35,000 pound capacities and much more. COMPLETE SERVICES include the use of our truck fleet for pick-up and delivery which we offer as an added customer convenience. Our plant facilities include a large truck dock area for incoming and outgoing materials, permitting quick turn around.